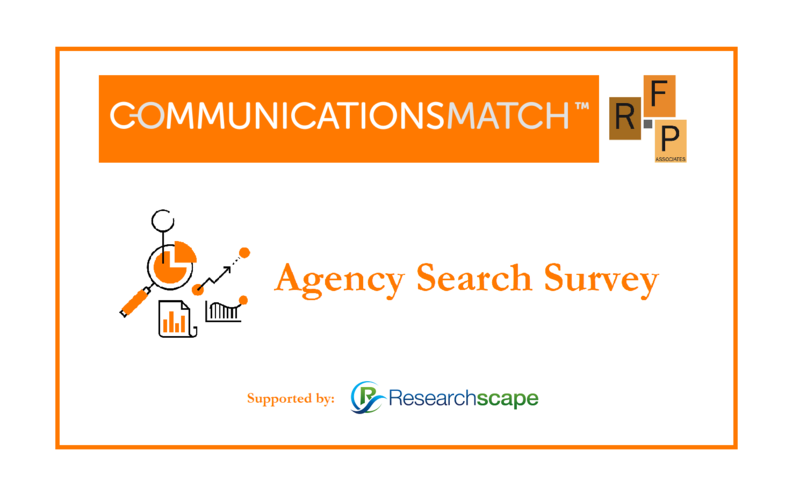 CommunicationsMatch™, RFP Associates, and Researchscape shared the interim findings of the 2019 Agency Search & Hiring Survey at the IPR Bridge Conference in Washington, D.C., on April 11. Read the press release. View a one page summary. The results of the survey into search practices of large companies and large non-profits show 64% of respondents citing word-of-mouth and 70% relying on their industry knowledge in the process of finding, evaluating, and selecting agencies. The research shows respondents working with multiple agencies. One third work with more than four agencies. In equal numbers, respondents said their most significant (primary) agency relationship is with a large, holding company-owned agency (29%), a mid-sized independent agency (28%), or a small/boutique independent firm (26%). Sixty-seven percent of respondents said they use RFPs when hiring agencies. Around 40% work with procurement departments as part of the selection process. A third work with marketing departments when choosing communications agencies. More than two-thirds of organizations say they are satisfied with their agency search processes and the agencies they have hired. Consistently, 40% to 50% of respondents reported that they were moderately or only slightly satisfied with specific components of that process. Two-thirds of respondents said they identified just two to five agencies in the hiring process, which many recognize may not be enough. Leaders recognize issues with the RFP process and aren't consistently providing all the information agencies need. Only half include detailed selection criteria or agency budgets in their RFPs. Some respondents noted that they felt agencies' responses to RFPs were boilerplate and also that they used the process to upsell services. Whether this reflects a lack of clarity in organizations' RFPs or reflects a more general lack of enthusiasm toward RFPs isn't clear from the research, but a key takeaway is the opportunity to improve the RFP and search process. As a potential concern for large agencies, higher budgets were equated with lower levels of satisfaction. The keys to client satisfaction according to the responses provided are agency proactivity, effective account coordination, staff stability, meeting objectives, operating within budgets, and meeting deadlines. The final results and full survey report will be published in May. The results are based on 101 survey responses (53 complete, 48 partial) as of March 25. The online survey was fielded with communications officers and executives at Fortune 1000 companies and large non-profit organizations starting February 25. Data will be collected through April 12, 2019. CommunicationsMatch’s agency search, hiring tools and resources save companies time, achieve better search outcomes, and build stronger brands. With 5,000 agency and individual profiles, companies search for communications partners by location, size, clients, keywords, ownership, designations, diversity and more. CommunicationsMatch also offers agency search consulting, communications research tools, as well as programmer & developer search. Researchscape International is an agile market research consultancy delivering high-quality custom and omnibus surveys, automated reporting tools, and other research-related services to marketers and agencies. Its surveys are frequently used to drive thought leadership, support content creation, and help grow organizations’ public profiles. Other services support specific client needs including concept testing, feature prioritization, crisis communications, customer satisfaction and more.